When I created sass & veracity more than four years ago, it was to give myself a space to write about my life as it relates to food — with just the hint of a smirk on my face. The chances of my being completely serious about it never occurred to me at the time even though I’ve always been someone who is passionate about food. I wanted to be light-hearted about it all, never expecting that I would be writing precise directions for recipes or searching for just the right light to shoot photos of the food we ate on a day-to-day basis. What I did expect was stories — stories connected to life’s often pivotal moments and weaving it all together. Stories about pregnancy and Monday night post Lamaze class burritos. Sunday morning hamburgers and Charlie Chan. Or stories about why cold yams and spilled milk will always remind me of one of my grandmothers. Biscuits and old boyfriends, raw shrimp cocktails and romantic dinners at home, and an old, dear doggo who loved tortilla chips. Stories just like that. And in the process, I thought perhaps I’d keep myself (and my best friend) focused on a diet we’d promised ourselves we’d go on, thinking if it’s written down, then we’ll stick to it. I also thought that considering the number of cookbooks I own and food magazines subscribed to, trying new recipes and talking frankly about them would be a fun diversion. After all, it’s what I’d done for years minus a food blog. With my youngest son just beginning high school at the time, and mulling over a stay-at-home-mom status for the first time in my life, I knew I’d look forward to that diversion. There was no real hustle bustle in our small family of three, no school lunches for little kids to pack, and nary a picky eater in residence to cater to. Instead, my life-long affection for cooking would continue to grow, fueled by new found time to experiment with flavors I’d not tried before, and techniques I’d been too busy to find time to learn. So I rolled up my sleeves and got busy. But something happened along the way. As seemingly hundreds of millions of new food blogs have appeared — okay, thousands? — I began to feel as if a current I hadn’t anticipated was pulling me along with it. If discovery is in order — and it should be — then heading in an unexpected direction could constitute quite an adventure. But there’s a huge difference between looking around and feeling as if one is on a freeway during rush hour in LA instead of a lazy river paddling a kayak, or on a mountain trail, hiking through the trees. Give me the river or mountain trail on any day. So it makes sense then, that I’d enjoy cooking from Simply Scandinavian: Travelling in Time with Finnish Cuisine and Nature by Tero Kallio and Kimmo Saira. It’s a breath of fresh air. Although my husband and I enjoy traveling, we’ve never been to Scandinavia, so our knowledge of this area of the world and its cuisine is lacking. If asked about what marks the region’s cuisine as being unique, I’d struggle to come up with an idea outside of the ebelskivers we enjoyed in Solvang, CA many years ago, the Finnish Pulla I once made, or more realistically, the food displayed in Marcus Samuelsson‘s beautifully photographed book, Aquavit. It’s all new to me. At first glance, Simply Scandinavian looks like something I’d expect to see on a coffee table instead of a kitchen — especially my kitchen. I’m not the neatest cook. Its glossy pages of large photographs featuring seasonal flora and fauna mingling with those of fresh ingredients featured in recipes would need to be protected from my splashing and stirring to preserve its beauty. As much as the book features dishes “faithful to the Scandinavian tradition,” influences from other regions are acknowlegded as are the effects of interesting times in history where ingredients were affected by war shortages. With an open mind I scanned the ingredients lists to get an idea of just how different this cuisine might be, surprised by what I found. Many recipes included ingredients I’ve never heard of and had to do a bit of research on to begin to consider what might be substituted. Vendace, sal ammoniac, cloudberries, swede, and most unusually, beestings, were all ingredients I googled. Other ingredients such as reindeer, moose, birch sap, treacle, and rose hips were more familiar, but perhaps not as easily found in San Diego for a home cook wanting to sample Scandinavian dishes. 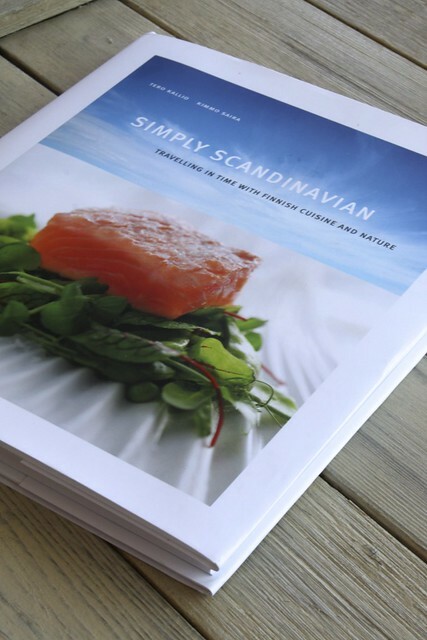 Organized by seasons, each section of Simply Scandinavian provides recipes for appetizers, main courses, and desserts. A simple vegetable “Summer Soup” caught my eye as did the “Strawberry Meringue,” both of which would be lovely to enjoy at this time of year. The “Cep Pie” sounds fantastic, but I’ll have to substitute mushrooms available here, so I’ve tagged that one for another time. “Karelian Stew” which includes beef sirloin and pork loin with vegetables in beer laced with allspice berries is also on my list of recipes to sample. Many of the main course recipes include allspice as well as some sweetness provided by a syrup, or fruit, so I decided to begin with “Loin of Pork, Cauliflower Puree, and Dark Beer Gravy” which called for treacle, a syrup. But I’ll post that another time. 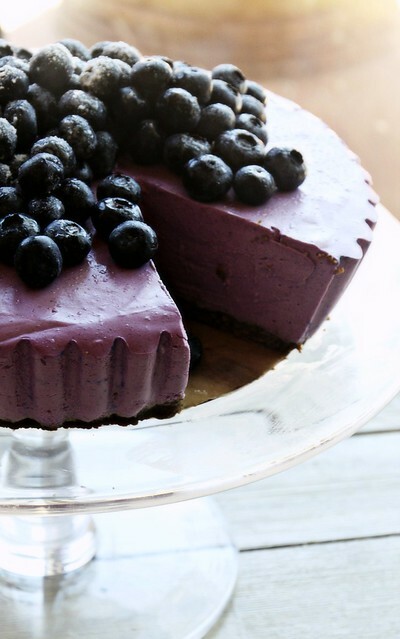 “Blueberry Cheesecake” is perfect to try now since blueberries are so plentiful and the recipe required no cooking — something that appeals to many home cooks. Crush the biscuits into crumbs using a food processor. Mix with the melted butter into an even paste. Press the paste into the bottom of a dish with a detachable base covered with baking paper. The biscuit base should be approximately 5 mm (0.2 inch) thick. Pour the water and blueberries into a saucepan. Pulp the berries with e.g. a pestle Boil for a while. 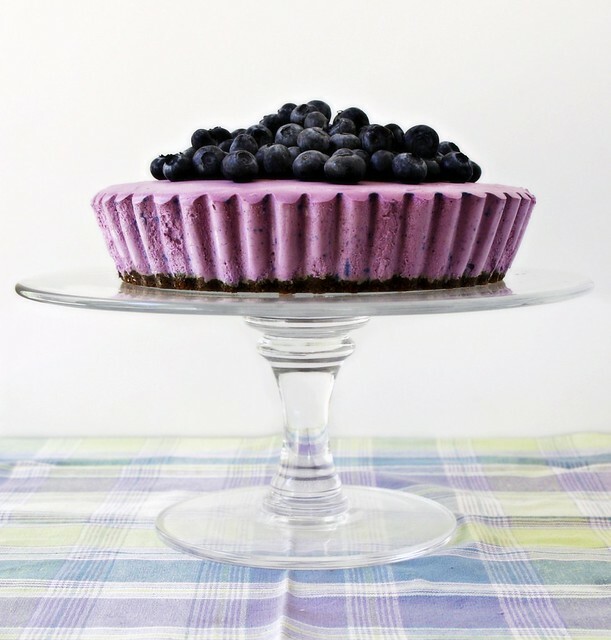 Strain through a coffee filter, this gives you a clear blueberry juice. Pour the juice back into the saucepan. Soak the gelatin sheets in cold water for about five minutes. 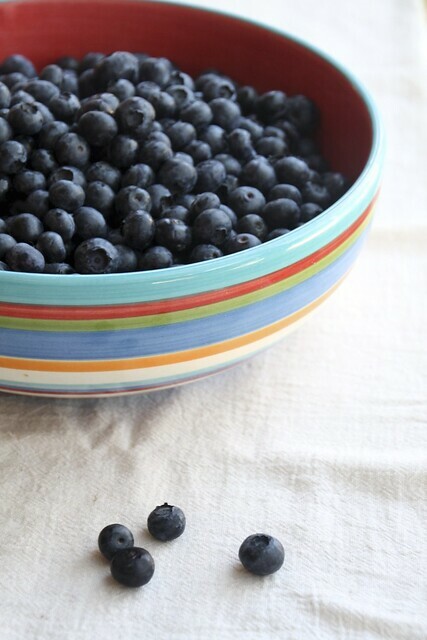 Squeeze the water out of them and add them to the blueberry juice at a low temperature. Wait until the gelatin melts. Allow to cool. Whip the cream. Mix the cream, cheese (*see notes below), sugar, lemon juice, blueberry juice and whipped cream. Stir until the mixture becomes evenly purple. Cover the biscuit base with the mixture. Smooth over the surface of the mixture with a spatula. Allow to rest in its dish in the fridge for at least four hours or overnight. 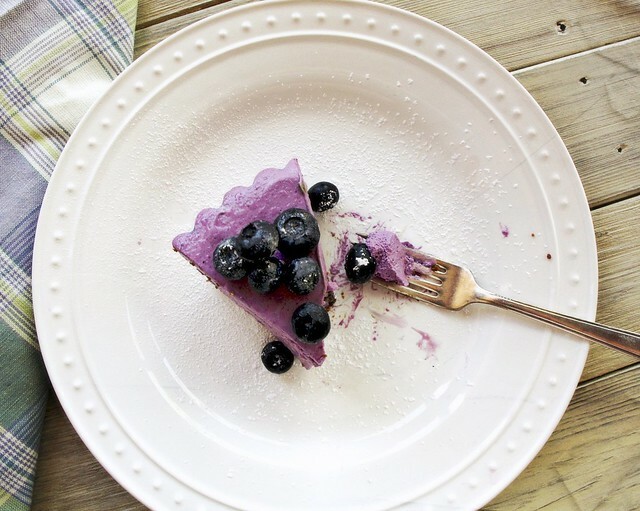 Decorate with blueberries and icing sugar. If you’ve never cooked from an international recipe, then having a kitchen scale is invaluable for many reasons. It makes it very easy to create the recipe without having to do conversions yourself, but more importantly, it provides a way to make sure that the English measurement and its international conversion is accurate. There were some discrepancies printed in the original recipe. ***The recipe calls for 1 liter or “8.4 cups” of blueberries, but 1 liter = 4.3 US cups — about 50% less than what the recipe states. And since this recipe is calling for the juice of the blueberries to be used, I immediately worried about ending up with a thin mess so went with the 1 liter measure for the whole blueberries. The recipe mentions that the blueberries should “boil for a while.” I allowed the juice to boil just until reduced to 2 cups of juice. There’s a liquor store not too far from our house that has a convenient selection of British pantry items — like Mcvities digestives — but I went with the gingersnaps in my own pantry. I’d used them in a cheesecake before and knew they would work out just fine. Most often, I bake the crushed cookies after they’ve been pressed into the pan before adding the filling. But in this recipe, there’s no baking involved and the crust — although discoloring due to the intense color — holds up fairly well. 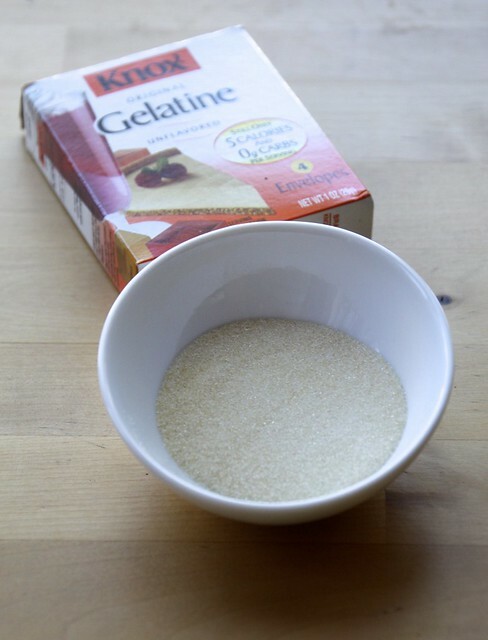 On the gelatin sheets: there are 10 sheets to 1 oz of powdered gelatin, so 5 sheets equal 1/2 oz of powdered gelatine. 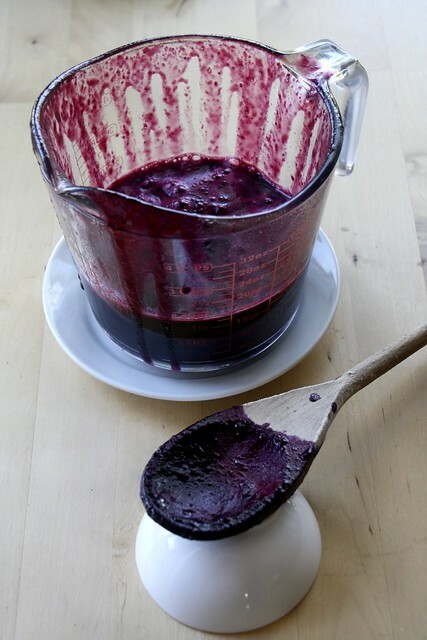 I added water to it to soften it before mixing it into the blueberry juice. ***I used extra fine sugar and did notice the recipe called for “fl oz” for what is normally a dry ingredient. I used the ml measure and forged ahead. Instead of vanilla sugar, used 1 tablespoon of liquid vanilla. 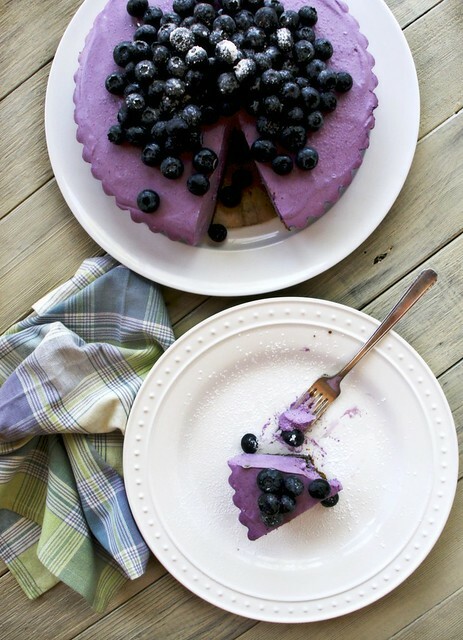 I allowed the cheesecake to set overnight before piling on the blueberries and sprinkling with powdered sugar. The flavor is fresh, fruity, and pleasant. 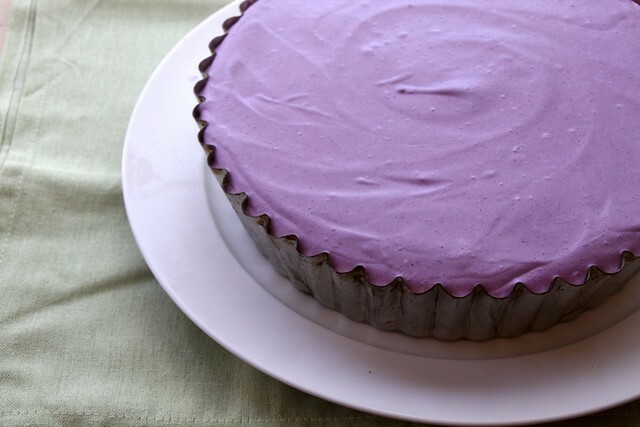 The texture is more like that of a chiffon pie, and although the cream cheese is tasted, it’s not as strong as what I’m accustomed to in a traditional cheesecake. Speaking of the cream cheese: the directions include another typo, I believe. There should not be a comma between “cream” and “cheese.” At first I wondered about whether there was a quantity of cream not listed which wasn’t whipped. A technicality, but an important one should someone think to add liquid cream to the filling ingredients. To release from the pan, apply a very hot, damp cloth to the exterior of the pan until light pressure on the bottom allows you to push it upward. It stores nicely in the fridge, and even travels well should you want to share it with others. I’d love to try a mixture of berries or perhaps other fruit — like mangos — or if cloudberries grew here in San Diego, that would be perfect. I was not paid to review this book, and the opinions I’ve expressed about it are my own. Beestings, a primary ingredient for the “Beestings Brulee” recipe is essentially colostrum, or the liquid mammals secrete before milk is produced. Here is a great piece on cooking with colostrum from a New Zealand small farms website. Treacle is a syrup produced in sugar refining, much like Golden Syrup. Vendace, a fresh water fish found in colder regions of the world can be one of many varieties of whitefish such as this one, and is considered endangered in some areas. I found a source for reindeer or caribou meat online, but would rather not link to it. It’s amazing what one can find on line, isn’t it? Sal ammoniac has been used in baking to produce crispness in cookies as well as to make a salty licorice candy popular in Scandinavia.